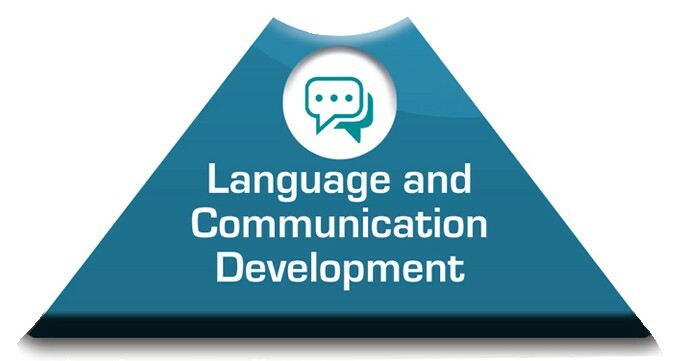 Language and communication development includes understanding and communicating through spoken and written words. By the time a child reaches kindergarten, his or her ability to communicate thoughts and feelings through spoken language takes on new importance. Your child's communication skills include the ability to express thoughts and feelings as well as the ability to understand others. Research shows there is a strong correlation between a child's ability to learn to read and the enriching language experiences he or she has at a very young age. Speaks in five- to six-word sentences. Recognizes and says simple rhymes. Knows his or her own full name. Reads and writes his or her name. Knows his or her home address, phone number, and birthday. Knows the differences between print and pictures. Knows that books are read from front to back. Knows that print moves from left to right, top to bottom. Recognizes familiar print from surroundings (traffic signs; store logos, such as K-Mart, McDonald's, and Walmart; food labels). Listens to and responds to stories that are read to him or her. Uses scribbles and drawings to express ideas. Uses pictures to tell a story. Recites the letters of the alphabet. Identifies upper- and lowercase letters of the alphabet.